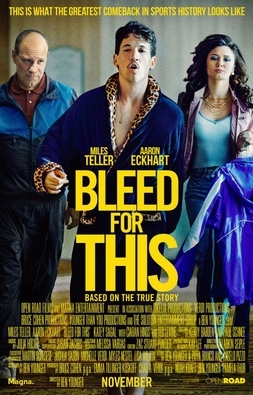 Thisfunktional will have some interviews coming up with the cast for “Bleed For This” so why not giveaway some tickets to an advanced screening in Los Angeles. This LA screening will be taking place at the Cinepolis in Pico Rivera on Nov. 16 at 7:30 p.m. If you want to get the tickets, click on this link: gofobo.com/SZBbV24232. The tickets are first come first serve so once they are gone they are gone. This movie is good, so click away and good luck. After cocky Rhode Island boxer Vinny Pazienza (Miles Teller) takes a brutal beating from Junior Welterweight Champion Roger Mayweather in 1988, fight promoter Lou Duva (Ted Levine) urges him to retire. Instead, Pazienza moves up two weight classes under the guidance of his shrewd new trainer Kevin Rooney (Aaron Eckhart). Rooney’s radical strategy pays off when Pazienza, 14 pounds heavier, takes down French boxer Gilbert Delé in front of a hometown crowd to become Super Middleweight champion of the world. Pazienza doesn’t have much time to relish the victory, however. Shortly after the bout, a head-on car crash leaves him with a broken neck. Initially told he may never walk again, doctors recommend spinal fusion surgery that would guarantee mobility but effectively end his boxing career. Pazienza chooses the far riskier “halo” spine-stabilization treatment, requiring him to wear a circular metal brace screwed directly into his skull for six months. Recovering in the modest home he shares with his fiercely devoted father Angelo (Ciarán Hinds) and anxious mother Louise (Katey Sagal), Pazienza secretly starts weight training in the basement with the help of a reluctant Rooney, and begins to rebound emotionally as well as physically. Thirteen months after the accident, the man fondly known as “The Pazmanian Devil” returns to the ring to do battle with Super Middleweight Champion Roberto Duran (Edwin Rodriguez) in the biggest fight of his life.